Inhibition. GABA is the main inhibitory neurotransmitter in the the Central Nervous System. Given that epilepsy is typically associated with increased excitability, all mechanisms related to GABA signaling are of natural interest to the epilepsy community. Almost 15 years ago, mutations in GABRA1, coding for alpha-1 subunit of the GABA-A receptor, have been identified in familial Juvenile Myoclonic Epilepsy, but there has been relative silence around this gene since. Now, two publications highlight the other side of GABRA1 as a gene for epileptic encephalopathies, putting the GABA receptor into the spotlight again. GABA. Whenever I think about GABA, I recall a lecture in medical school when once of my professors called gamma-amino-buteric acid the “main transmitter in the brain that says NO to neurons”. The functioning of our neuronal networks is critically dependent on the proper interaction between excitation and inhibition and the inhibitory side, mainly involving GABA signaling, plays by its own rules. The GABA-A receptor is composed of five subunits, including two alpha subunits that are typically encoded by the GABRA1 gene. The other subunits are beta subunits and gamma subunits. The latter are encoded by GABRG2, which is also associated with familial idiopathic/genetic generalized epilepsies. In summary, genes for GABA receptors are a natural candidate. GABRA1. Initially, GABRA1 was identified as the causative gene for a familial Juvenile Myoclonic Epilepsy (JME) in a large French-Canadian family. This family carried a p.A322D pathogenic variant in GABRA1. 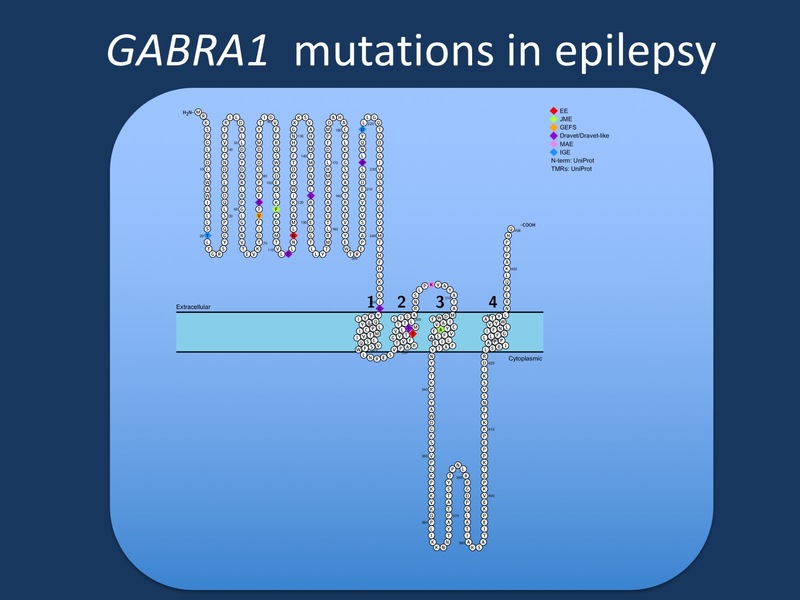 After this, several individual reports have highlighted de novo GABRA1 mutations in patients with absence epilepsy and more severe epilepsies such as Dravet Syndrome. However, a systematic analysis of how pathogenic variants in GABRA1 manifest themselves phenotypically, was missing. Now, two publications highlight the emerging spectrum of GABRA1 mutations. In a recent publication in Epilepsia, Kodera and collaborators identify de novo pathogenic variants in GABRA1 in patients with Infantile Spasms and Ohtahara Syndrome. At the same time, we are part of a publication by Johannsen and collaborators in Neurology, which highlights the phenotypic spectrum of 17 additional individuals carrying pathogenic GABRA1 variants. So what do these two publications tell us about GABRA1? The unifying theme. Categorizing patients into diagnostic entities sometimes blurs the perspective for shared phenotypic features. Accordingly, the study by Johannsen and collaborators, we also looked at specific seizure types, EEG patterns, and other phenotypic features. It is interesting to note that generalized spike-wave activity is observed in 90% of all patients and up to 50% of patients have a photoparoxysmal response. These features are typically associated with generalized epilepsies and are somewhat of an uncommon finding in early-onset epileptic encephalopathies. Taken together, the GABRA1 phenotypic spectrum is unified by EEG features reminiscent of generalized epilepsies, even in patients with phenotypes where these features are not very common. This is what you need to know. Two recent publications highlight the phenotypic spectrum of pathogenic GABRA1 variants in human epilepsy. Initially considered a gene for Juvenile Myoclonic Epilepsy, GABRA1 is re-emerging as a gene for epileptic encephalopathies with a broad phenotypic range. Some of the de novo pathogenic variants seem to be recurrent, including p.R112Q, p.G251D, p.M263T, and p.K306T/I, which may help identify further cases in the absence of segregation data. Haploinsufficiency is considered the pathogenic mechanism. Epilepsiome page. Katrine Johannsen, the first author of the Neurology GABRA1 publication, has compiled the Epilepsiome page for GABRA1, which can be found here. As with the other Epilepsiome pages, it will go through a regular review and we will let you know about the updates. This entry was posted in 2016, GABRA1, Updates and tagged GABRA1. Bookmark the permalink. If haploinsufficiency is the mechanism, we would expect to see frameshift and nonsense mutations as approximately half of the total – is that the case for GABRA1? this is actually a good question that I was thinking about when writing this, as well. At this point, the number of patients is probably too small to precisely quantify the fraction of patients with truncating mutations. However, the relative frequency of recurrent mutations is intriguing, which would argue against a simple haploinsufficiency mechanism.